Ian, Ethan, Tess, Indy and Jazz on a bench at Hattaras Light Station. This is Sammie doing what he loves most at the beach...retrieving his bumper from the surf. Indy and Shaina meet up for a play date on the beach. Here's the whole gang at Hatteras Light Station: Kim, Eric, Ian and Ethan with Bently, Twist, Scorch and Blizzard; Jim and Mariann with Sammie; me and Jim with Jazz, Tess and Indy; and George and Lois with Toby and Shaina. After we took this picture, a woman stopped and asked me if there was a dog show going on!! I told her that we are just a bunch of friends on vacation. How blessed we are to be a part of this crew who loves to relax and spend time with good friends and their dogs. The fact that we get to do that at the Outer Banks is just icing on the cake!! We had another awesome week at the beach and look forward to next year's adventures. Even though we are back home from the Outer Banks, I have a few more posts of beach pictures to share. Jim took nearly 600 pictures while we were at the beach (thank heavens for digital cameras)! After a morning at the beach, here are some pictures of the Dals lounging on the deck by the pool at our beach house. Rough life, huh?! Apparently, the dogs enjoyed a "no rules" vacation. ...and two minutes later, I see Tess standing on the picnic table!! Indy wants you all to note that the sign says "No Diving," not "No Running with Toys"!! Here's Jazz violating the "don't sit on our guests" rule. Somewhere under all those spots is Mariann! The start of another beautiful day on Hatteras Island. Indy is starting to wander into the water a little more instead of running away from the waves! Jazz and Indy head into the surf. Tess jumping for joy over being at the ocean again! Now, I know our Dals have had lots of adventures, but hang gliding?!! 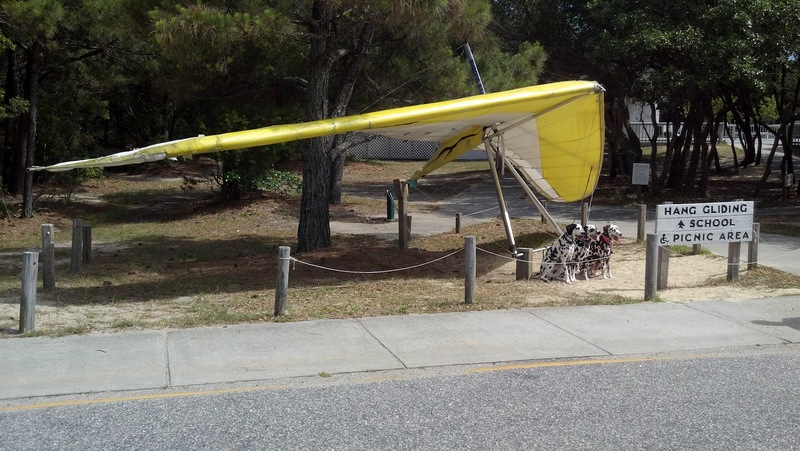 We snapped this picture while visiting Jockey's Ridge State Park this afternoon...and, no, we didn't let the Dals attend hang gliding school!! In addition to teaching Indy to dig in the sand, Tess and Jazz are taking him to some of their favorite vacation spots, including the Cape Hatteras Light Station. When we put the three Dals in a sit stay in front of this sign, swarms of people showed up wanting to take their picture, and they got lots of pets and attention for being so good. We also wanted to take Indy to Ocracoke Island, but the ferry from Hatteras Island to Ocracoke Island was not running. Apparently, there have been changes in the channel between the two islands and a ferry ran aground on Sunday. Of course, ferry service was suspended and will not resume until the channel is safe to travel again, so Indy may have to wait until next year to take a ferry ride to Ocracoke Island. Indy Digs the Outer Banks! We're on our annual vacation in the Outer Banks. This year is Indy's first trip to the beach. He did really well on the ride down and has been enjoying the beach. Tess and Jazz wasted no time in teaching Indy the fine art of digging in the sand! Here are some pictures of a typical sunny day around here. Jazz and Indy just love lying on the back of the couch soaking up rays! Speaking of Sun Spots, we found a great website with fun spotty t-shirts called SPoT oN be your own spot (http://www.beyourownspot.com/). They have an adorable Sun Spot shirt, as well as many other great designs. I got Jim a Fishin' Spot t-shirt and it arrived yesterday (along with some fun decals and treats for the dogs). He wore it to Indy's puppy agility class and it was in the laundry before I could even snap a photo of him wearing it! ﻿The inspiration for these great designs is Sydney, the owner's Dalmatian. She's a cutie! I hear there is even a design in the works for a LIVER SPoT! !